It isn’t often that an exotic brand offers a big bargain, but Maserati North America has 1.9 percent financing for 60 months on its flagship Quattroporte sports sedan. The deal marks the debut of Maserati’s new captive finance arm.Â Maserati says it’s a one-time deal on the car – the equivalent of a year-end sales event. 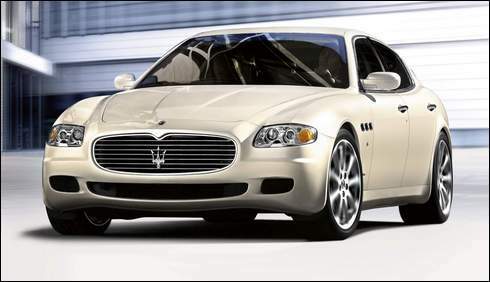 The deal is only available on the 2006 Quattroporte, which starts at $108,750, including shipping and gas guzzler tax. A spokesman says 60 vehicles remain in dealer stock. The offer expires Sunday, Dec. 31. But the promotion, which also offers the option of 2.9 percent financing over 72 months, is a test “to see if those customers looking at an $80,000 competitor car would make the leap to Maserati,” a spokesman says. The savings from a 1.9 percent loan can be considerable: about $200 a month, assuming a 20 percent down payment and alternate financing at 6.9 percent. That’s about $12,000 over the five-year loan. The financing is being offered through Maserati Financial Services, the new captive financing arm that will be announced at the Detroit auto show. The finance company is a subsidiary of Fiat S.p.A.’s CNH Capital America LLC financial services company. CNH Capital, of Lake Forest, Ill., provides financing for Fiat’s New Holland construction and agriculture equipment units in the United States. Maserati dealers previously offered financing through outside lenders. The captive finance arm is likely to provide financing for Alfa Romeo when it returns to the United States. Alfa Romeo is expected to re-enter the United States in 2009.